The photos of our lunches on the 25th of December over the past 17 or so years are remarkably the same. Oh yes, we have had a few bad hair do’s and silly expressions caught in mid bite, but the laughter and totally relaxed mood of these shots continue to show up year after year. We always invite other families to join us for the marathon day of eating, swimming, and great conversation. Everyone brings something different from their culture to the table, and most often we will hear Dutch, French and Kiwi pepper the meal with laughter. It is the most wonderful day to embrace a day of joy together. Friends forever. Night slips over the hill and the guests retreat to their villas, and it is then that we might finish the day with a game of scrabble or a movie, and a glass of leftover champagne. The vacation seems endless, and each day is filled with a new cast of characters arriving after their holidays at home and before New Years Eve. Days are as active as one cares to be, and yet a passing tropical rain can be just the right excuse to lay back and read inside. 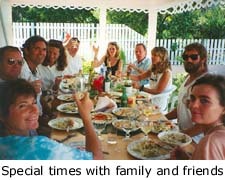 Lunches in one of the fabulous beach restaurants are a great time to check out life outside the villa, and to find a friend with whom to windsurf or meet for yet another meal. We love the fact that we see so many familiar faces, and genuinely look forward to seeing each other healthy year after year, despite inevitable changes. Everyone looks forward to the wonderful Sibarth party for their clients as a way to catch up and plan gatherings together, and it sets the tone for the celebration of the New Year. When I think of New Years Eve, I think of dinner in Maya's with family and friends, and of course the front row seat for the fireworks. The only missing person in this colorful montage is Larry who, as many know, used to organize the fireworks all over the islands that evening. His memory will live in the hearts of all who knew the person whose smile illuminated the evening. The town of Gustavia bursts open at the seams on New Years, with people gathered from all over the island on this little harbor front. Yachts strung with lights pulse and bob with the gaiety, and music can be heard on each ripple of water. Midnight is met with a cacophony of boat horns, heralding in another year, and the island rocks just a tad off the face of the planet. 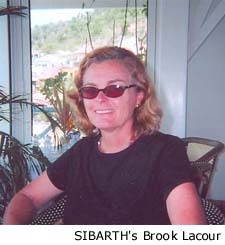 Parties are famous on St. Barts that night, as are the celebrities attending or throwing them. If you have the desire to dance on the beach all night long, then you will find parties you might never see anything quite like again. For you a wild night on the edge of one of the most beautiful beaches in the world might be just the way to ring in a new year, or perhaps a ride home after the fireworks under a star laden sky could satisfy you as well. Whatever your choice, St. Barts has it all, except the big ball dropping in Times Square. Oh well. As we round the corner into January, and thoughts start to lean towards getting back to reality, we enjoy a few more traditional days on St. Barts. 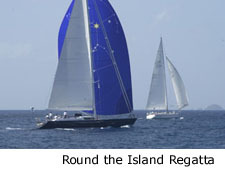 One is the Round the Island Regatta for those who can manage to arise on New Years Day. My husband races each year, and I watch the fleet of magnificent yachts of all sizes billow around the point of Lorient Bay on the final stretches towards Gustavia. Not a second to waste, and all the time in the world. What heaven to witness. The last gathering of clan and friends takes place on the Fete du Roi, an old tradition started in France. Boulangeries all over the island bake a special cake with a hidden secret prize. The lucky child or adult who bites into the piece containing the charm becomes the King or the Queen, and can in turn crown their chosen Royal mate. We have carried on this tradition and although the kids have probably figured out that they will both eventually have their turn at being Granpapa’s Queen, or crown one of their handsome cousins as their King, we have never tired of this game of intrigue and expectation. 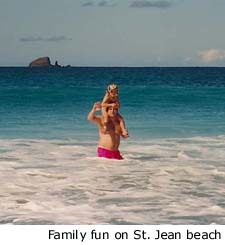 We love the familiarity of our Christmas holiday in St. Barts, and we look forward to these lovely, simple traditions as our lives become more complicated. Hope to bump into you this Christmas.